414 pages | 73 B/W Illus. Recent advancements in mobile device technologies are revolutionizing how we socialize, interact, and connect. By connecting the virtual community with the local environment, mobile social networks (MSNs) create the opportunity for a multitude of new personalized services for mobile users. Along with that comes the need for new paradigms, mechanisms, and techniques with the capacity to autonomously manage their functioning and evolution. Currently, most books about mobile networks focus mainly on the technical point of view. 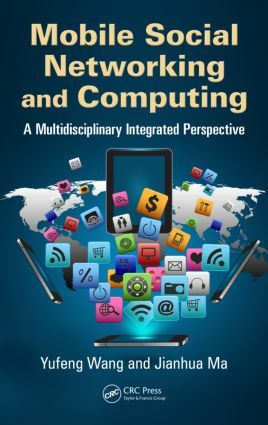 Mobile Social Networking and Computing: A Multidisciplinary Integrated Perspective not only addresses the theoretical aspects of MSN and computing, but also introduces and categorizes existing applications. It supplies a multidisciplinary perspective that considers the technology, economics, social sciences, and psychology behind MSNs. In addition to fundamental theory, the book investigates the practical issues in MSN, including characteristics, inner structural relationship, incentive mechanisms, resource allocating, information diffusion, search, ranking, privacy, trust, and reputation. Introducing recently developed technologies, modes, and models, the book provides two distinct (but related) viewpoints about MSN applications: socially inspired networking technology and networking technology that uses recent advancements to enhance quality of life. The text illustrates the interaction between the macrolevel structure and the local rational behaviors (microlevel) in MSN. It summarizes currently available MSN development platforms, including Android and iOS, and introduces and categorizes existing applications related to MSN and computing. Both location-based service (LBS) and mobile social networks in proximity (MSNPs) are presented in a comprehensive manner. Highlighting key research opportunities, this much-needed reference outlines incentive mechanisms inspired by classical economics, behavioral economics, and social psychology, and, perhaps for the first time, it presents a summary of the economic and business models of MSNs. Yufeng Wang received his doctoral degree from the State Key Laboratory of Networking and Switching Technology, Beijing University of Posts and Telecommunications (BUPT), China, in July 2004. From July 2006 to April 2007, he worked as a postdoctoral researcher at Kyushu University, Japan. In May 2007, he became an associate professor at Nanjing University of Posts and Telecommunications (NUPT), China. From February 2008 to March 2011, he was an expert researcher at the National Institute of Information and Communications Technology (NICT), Japan. Since 2013, he has been a full professor at NUPT and is also a guest researcher at the State Key Laboratory of Networking and Switching Technology and at the Media Lab at Waseda University, Japan. Professor Wang’s research interests include multidisciplinary inspired research on networking and systems, specifically new generation networks, peer-to-peer (P2P), wireless ad hoc network and sensor networks, trust and reputation systems, and mobile social networking and computing. Dr. Wang has published more than 40 academic papers in journals and conference proceedings and has organized two special issues on multidisciplinary networks and systems for the Telecommunication Systems Journal and the Journal of Computer and System Sciences. Jianhua Ma received his bachelor’s and master’s degrees in communication systems from the National University of Defense Technology (NUDT), China, in 1982 and 1985, respectively. In 1990, he received his doctoral degree in information engineering from Xidian University, China. He has been on the faculty of Hosei University, Japan, since 2000. Presently, he is a professor of computer and information sciences in the Digital Media Department. Prior to joining Hosei University, Dr. Ma had 15 years of teaching and/or research experience at NUDT, Xidian University, and the University of Aizu, Japan. Dr. Ma’s main research interest is ubiquitous computing, especially devoted to what he calls "smart worlds" filled with smart/intelligent ubiquitous things, or u-things, including three kinds of essential elements: smart objects, smart spaces/ hyperspaces, and smart systems. These are based on his vision for the future: ubiquitous intelligence (UI, u-intelligence) or pervasive intelligence (PI), solving the crucial problems caused by intelligence pervasion due to the fast progress of semiconductors, microelectromechanical systems (MEMS), nanoelectromechanical systems (NEMS), sensors, radio frequency identifications (RFIDs), embedded devices, ubiquitous computers, pervasive networks, universal services, and so forth.